www.earthovens.co.uk started it – a Sunday afternoon’s lazy random browsing on the internet clicking from link to mindless link, and all of a sudden I’d found my new project – I wanted an earth oven!!! So I enrolled on the course, last May, on a rainy Herefordshire weekend, and spent two days with 8 fellow dreamers learning how to build a traditional bread oven out of mud. A fab weekend it was too, despite the inclement weather – excellently facilitated by the knowledgeable and laid back Richard Scadding, and hosted in a friends idyllic converted chapel in the Marches, complete with existing bakehouse and earth oven, which produced some fine baked goodies throughout the weekend. Anyway, that was 2008, enough deliberation. I have been champing at the bit for over a year now, and finally my own project is under way – I’m aiming to finish in time for Lammas, the ancient harvest festival celebrated by baking a loaf with autumns first grain, on 1st August. Check out the Real Bread Campaign for other events happening in celebration of Lammas. I’ll be hijacking loafonline to chart the highs and lows of the project over the next few weeks, and if anyone wants to get involved then drop me a line at info@loafonline.co.uk – any willing feet for puddling, or bricklaying expertise will be gratefully received! I’m also hoping to share the finished oven too, not just keep it to myself, perhaps get some community baking going – so if this sounds up your street, do get in touch. 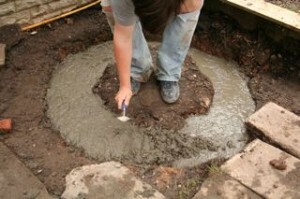 This weekend, with a little help, the foundations got dug, and the concrete got poured. 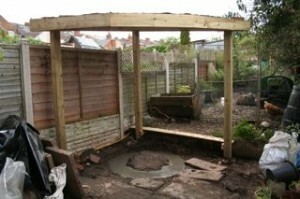 I’ve also had a shelter/bakehouse built by a carpenter friend, which eventually will have a sedum roof on top. 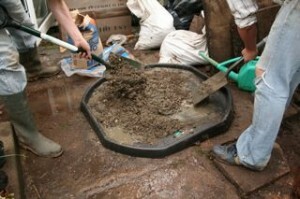 The foundations are a foot deep as I think the plinth and oven combined will potentially weigh a couple of tons! 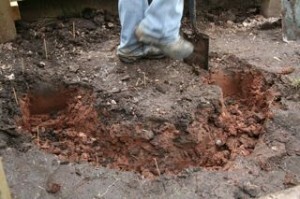 As the photos show, the plinth is circular and about 4 foot across. The concrete was poured on Sunday and is nice and hard already so I should be all set for starting the brickwork this weekend, I’ll let you know how I get on! This was loaf’s first year at Taste of Birmingham. We went on opening night (Thursday 9th July), with a small budget, on the hunt for real food from Birmingham and the Midlands. Cannon Hill Park was sunny and inviting, though the atmosphere was a bit like a high-powered networking event – packs of after-work suits stood around sipping champagne on expenses; loaf feeling a little out of place like we’d forgotten to get dressed. Anyhoo, the hunt began after loaf exchanged it’s meagre funds for the equivalent in crowns (the official event ‘currency’ – £1 = 2 crowns). There seemed little point in having crowns (a variable exchange rate might make it more interesting) and some of the stall holders were unofficially ignoring it and taking cash with raised eye-brows. 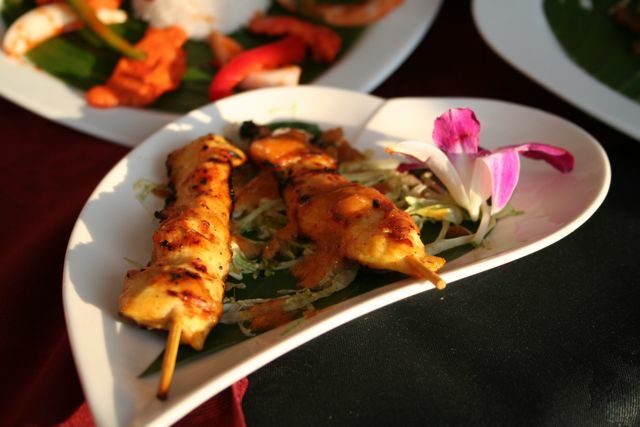 There are 16 or so local restaurants represented, serving out three dishes each – the busiest were the big names (Simpson’s, Filini, Cielo), and those with the most descriptive menu’s (Thai Edge, Lasan, Fushion Brasserie). Mal Maison were twiddling thumbs most of the night – their menu (‘Mal Burger’ et al) could have fitted into one SMS to the organisers the night before the event. Disappointed by the absence of Turners and Purnells (loaf was assured they’ll be present on Saturday and Sunday), loaf opted for Simpson’s delicate and sweet carpaccio of sashimi tuna with summer fruits scented with basil and verjus syrup, followed by Thai Edge’s hearty lamb penang with jasmine rice. The Small Producers Market uncovered one or two local producers – Just Oil producing rapeseed oil in various forms from it’s farm in Staffordshire, and the excellent Purity Brewing Company from Warwickshire, but the most exciting producer was Freedom Lager, a Staffordshire brewery claiming to be the only lager-only microbrewery in England. Both their organic lagers were smooth and enjoyable, and the company owner was selling the stuff, and clearly passionate about his product. With the strong influence of Heart of England Fine Foods on the festival, loaf hoped to have seen more local producers than there were, but then the festival is more big business than earthy and organic, so maybe that was a turn off from some of the smaller artisans. The entertainment highlight of the night was watching ‘Bobby’ sing Georgia on the BRMB stage, accompanied by the Jam House band – Bobby was a regular punter over here on holiday from LA, and was plucked out of the crowd to strut his stuff, a magical moment! There’s still time to head down there for the Saturday or Sunday sessions, and it’s certainly worth a look around. 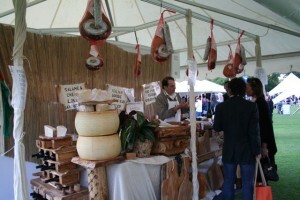 Taste of Birmingham food festival starts tonight in Canon Hill Park, and runs until Sunday. It’s supposed to be a celebration of Birmingham and the region’s food culture, with 17 local restaurants taking part, and a host of food producers from the region exhibiting. Loaf will be there for the opening session tonight, and is equally hopeful and sceptical about what awaits. We’ll be on the hunt for local ingredients among other bits – a bit of research for the soon to be launched local food directory! In previous years the cost has been somewhat prohibitive, but this year it’s much more reasonable (£10 advanced tickets), and is being launched by local agency Marketing Birmingham, so hopefully will be more in-tune with the local scene, and we’ll have less of the helicopter-travelling slebchef nonsense. Expect a full review in the next couple of days, and some twitter action from the fest tonight – another reason to follow @loafonline on twitter! If anyone else will be twittering from the event tonight, leave you’re twitter name in the comments below. La Banca has little competition in Cotteridge – the clean but classical decor is a far cry from Greggs or Subway – and provides a buzzing, excited atmosphere whilst loaf awaits it’s dinner guests. The welcoming and obviously experienced manager, belied a noticeably nervous front of house, with the understandable opening night jitters: uncollected cutlery, unpoured wine, bill mistakes, and longer than usual waits for orders etc. The menu is probably a bit too large for a single cuisine restaurant, but with a notable absence of pizzas – perhaps investment in a proper oven will come at a later date. 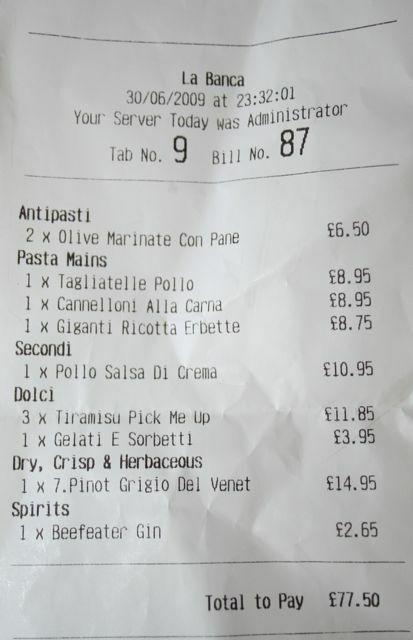 Pasta predominates, but there’s an enticing range of non-pasta ‘secondi’ too – the tuna steak with cold tomato salsa was tempting, but at £13.95 (the most expensive item) loaf couldn’t stretch to it in these credit-crunch times. The menu is spattered with seasonal treats – chard, peas, mint; but there’s no claim that this is intentional, nor is there any indication of where they are sourced. Nevertheless, the food was good – homemade canneloni was executed well and served in a deliciously fresh salty-sweet tomato sauce, and the tirimasu was smooth and luxurious, if lacking a little of the expected alco-kick. There were appreciative noises coming from round the table and the portion sizes were about right if you’re having more than one course. The wine list is excellent, and extensive, with great descriptions for those as ignorant as loaf! 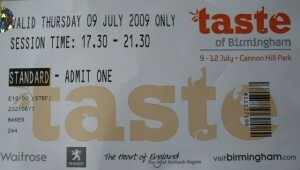 Went to the Birmingham international food fair on Wednesday evening. It’s a city council sponsored event organised by a French company, the first of what the council are hoping will be an annual summer event to replicate the popularity of the Christmas market. 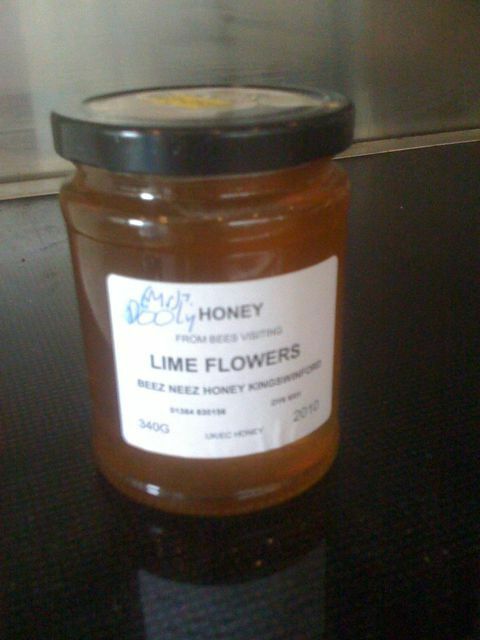 I was on the hunt for locally produced food and found a great honey producer from Kingswinford (12 miles west of Birmingham), the Beez Neez. They sell a range of honey’s from lavender, to lime flower, to acacia, all around £3-4. The best thing was that the bee keeper was also selling on the stall and very keen to offer an education in honey with every jar. I went for the lime flower honey, and it definitely has a noticeable citrus tang to it. If I can find some local stockists I’ll add to this post.